From age long days to hitherto women follows effete customs to mop the floor that are taking a piece of old cloth,bucket with full of soapy water and then bending knees and moreover squeezing the dirty wet cloth with hands.In this context their hand skin is peeling,fingers swollen,getting knee pain and so on.But they were inured to several pains and sufferings for the sake of their family health and welfare.So here I will unfold them heartening news i.e. 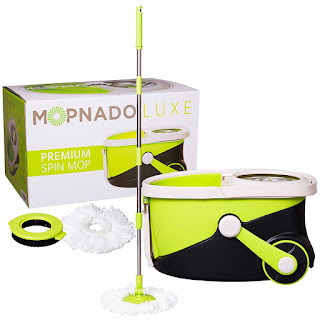 Mopnado stainless steel deluxe rolling spin mop,it will put to an end their problems. Super absorbent and soft enough microfiber strings soaking up any kind of liquid and clean almost any surface without leave any streaks. Bucket have two compartments and each one has unique feature.one compartment belongs to rinse portion and contain agitator,so it can agitate dirty particles of the mop and left it off in the same place.The second compartment is the drying portion which is made with stainless steel also known as spin chamber and it can shove water molecules into the rinse portion through the holes of the wall,so you can get as dry or as wet mop as you need.Company gives utmost importance for cleaning solution so that soap dispenser attached to the twirling basket.Exterior part of the bucket made by sturdy plastic.It is also contain two foldable handles and two rear wheels for easy mobility. Is it need buying handle extension part? The standard pole length is 56 inches,if you add extension,its total length reach up to 64 inches but the average height for women around the world is between 58 and 66 inches.So in my point of view,it is most suitable to u.s.,u.k.,canada and indian people even without extension. How to install the mop head to the mop plate? It can be installed under two ways:in the first method make sure clear of any stray strands around the plastic part,then place it inside the plastic plate and click it in with your hand. In the second method–Lay the microfiber fabric on the floor and make sure that there's no strands covering this plastic disc,then place the mop plate over it and afterwards step gently side to side with your feet.You will hear click sound indication of sitting right position. How to remove the mop head from the mop plate? This is also going into two ways:In the first method–mopnado company directed to us that is,grab the mop plate,grab the microfiber strands and pull apart but I am afraid this is not good way because all strings sewed to the round shape neck which is plastic material,so may be,perhaps laces fell off from it if you to do like that. Now coming to second method–on each side of the stick has two white circles are there,so put your foot on one adjacent side of the strands towards one white circle then tilt the stick at opposite side,that's it pop right off. Installation and separation of scrub brush is similar to the first methods of the mop head.But don't follow second kind of methods because brush bristles crushed and sagged. Bottom rod of the handle has twist lock button that contains the gears which allows to spring action and wet or dryness of the mop depend upon how much speed you are applying on the pole in a up and down motion.That means if you spin faster,you will get a dry mop or spin slower,you will get a wet mop head but remember it doesn't have splash guard like O‐cedar spin mop,so start off slowly and build up speed. Spasmodically this deluxe cleaning system handle has come to a stand still from its up and down action due to not release locking position.Some other times occurring damage from normal use or not used in accepted standards or faulty part and or putting heavy stress on the pole.In case you have face those concerned problems,please contact customer service department as early as possible. If you pouring water beyond the inside mark,it will cease spin action.This is one of the foremost points in the total working nature,so please inject this worth remembering point into your mind. Usually we are tilted the handle in 45 degrees at the time of mopping for the mop plate stays flat on the ground but straight up position(90 degrees) is must before immersing into either in rinse section or twisting chamber,otherwise plastic plate clogged for doing its function. are these spin chamber and handle rust free? Yes,absolutely.Both of them made with stainless steel material,so impossible to corrosion unless using harsh chemicals as well as immersing in chlorinated water e.g. sea water.So mopnado clearly specified innocuous chemicals such as vinegar and water solution for mopping. Microfiber truly machine washable at cold settings after that dry it on air.Here two things everybody should remember,these are don't put it in dryer machine and desist from Bleach,these things defile the fabric performance. Many users start liking mopnado stainless steel deluxe rolling spin mop as they spend more time with it,especially though they disliked it in the beginning,so I certainly to say,as you use it more and more times,you will definitely warm up to this device.